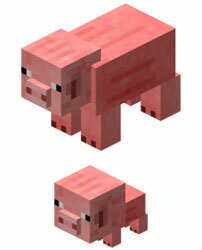 Pigs are pasive animals which ilve in the Minecraft’s Overworld. This is a very important animal when we are talking of food resources which will let you survive from pork. Its apperance is more like a real pig, which consists in pink skin and dark eyes. They have a little tail y a little snout. This animal wander by the world without any purpose. Like other pasive animals they will be attracted for lights, even more in the dark. Minecraft Pigs move walking, they can jump blocks though. Two adult pigs can breed by giving them seeds to each one. Then they will come together and then a baby pig will appear. Players can ride pigs by placing a saddle on their backs. They can be lead using a fishing rod, with a carrot tied at the end. But you have to consider that they are slow and you can not use them to move with effectiveness. Pig can appear in any zone of the Overworld of Minecraft. They will never appear alone because they are always generated in groups of 3 or four animals.